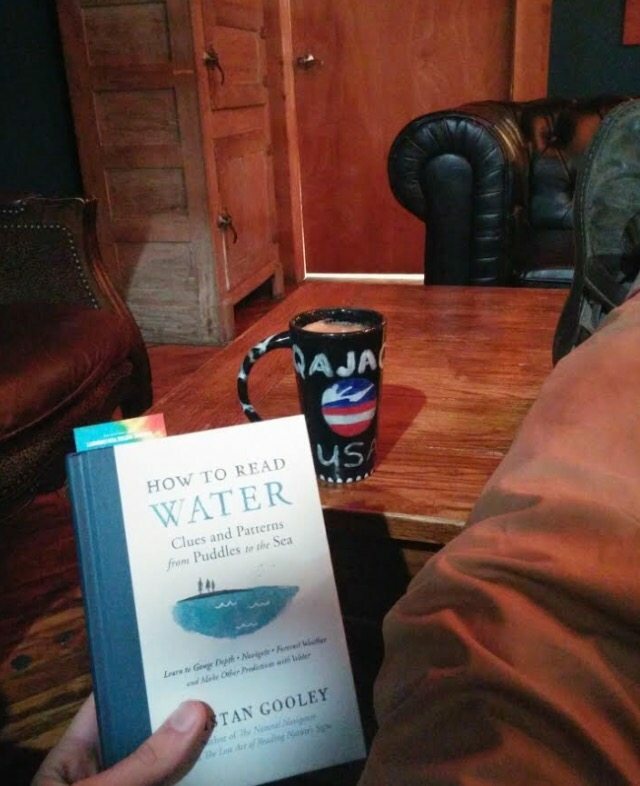 DIRT BAG BOOKCLUB ~ Tristan Gooley’s “How to Read Water, Clues and Patterns from Puddles To the Sea”. 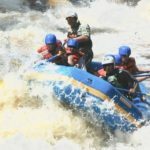 by Tim Gallaway | DBP MAGAZINE ONLINE The World's Best Free Whitewater Publication. We’ve all caught ourselves staring at the water. My local beach is always covered with people going for a stroll out on the breakwater to the lighthouse and taking selfies in the sunsets. It is even worse when the autumn winds whip up the Big Lake (Lake Michigan) into a frenzy. The same thing occurs with any picturesque bit of winding river or tumbling rapid that a footpath follows. And it is at this point where the keen people watcher will notice who is looking at the water and who is reading it, studying it, analyzing it’s every ripple, bubble, and vortex. There is an amazing amount that we can learn by watching the water. Reading the water is something that (eventually) comes naturally to any river rat, surfer, sailor, or water taxi driver. It is a skill that can make a day more enjoyable or can save your life. 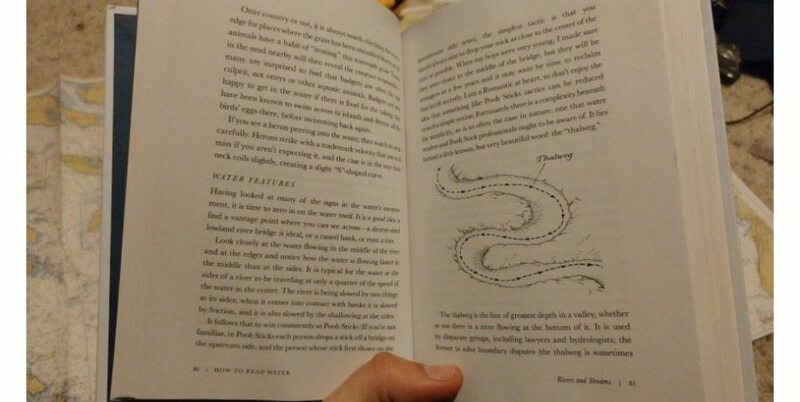 I got How to Read Water, Clues and Patterns from Puddles To the Sea by Tristan Gooley as a Christmas present from my sister and bro-in-law who are to mountains what I am to water. At first I thought it was a bit of a family inside joke until I read Mr. Gooley’s resume. 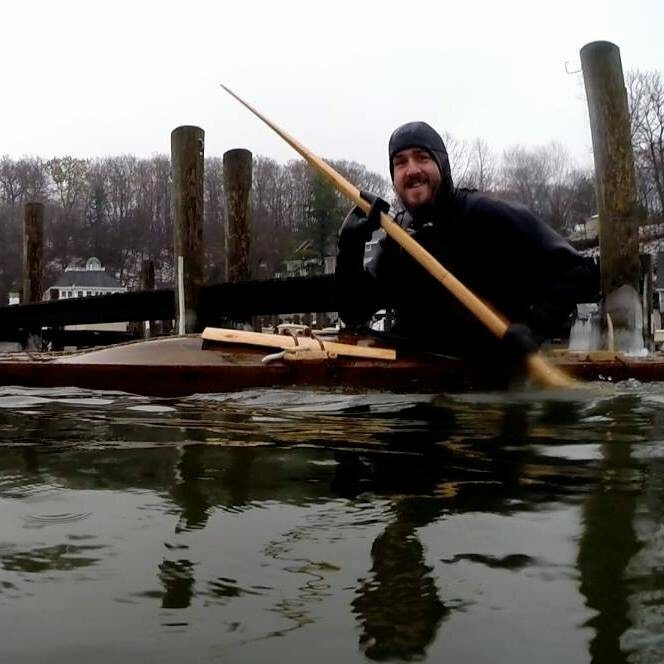 A self-described Natural Navigator, Gooley has an adventure resume that would make John Muir, Bernard Moitessier, and Charles Lindbergh jealous. He’s sailed and flown solo across the Atlantic, studied the ways of numerous indigenous cultures around the world, and published several other books about natural navigation methods. This has made him one of the foremost experts on traditional navigation in the world. 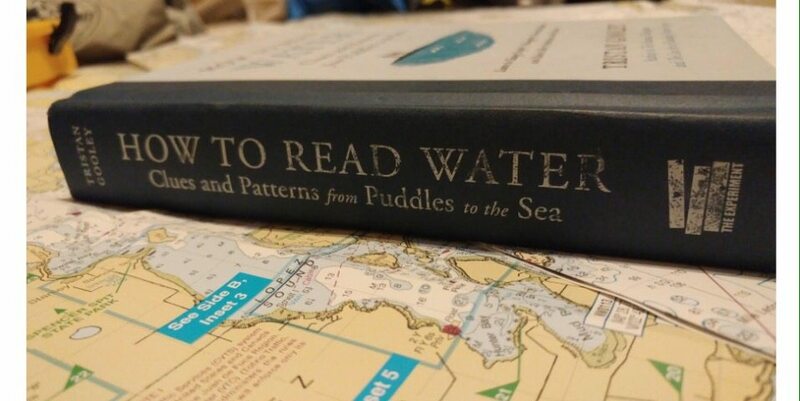 After about a decade of serious rough water paddling in the Great Lakes and rivers of the US and Canada I feel I am fairly competent at water reading but after reading this book I realized how many gaps in my knowledge there were and how many aspects of water reading I was completely missing. The book covers so many topics it can at first seem a bit daunting to tackle. It starts off with the fairly mundane, puddles. But the wonderful thing about this book is how it takes things we would normally pass by, like the humble puddle, and through keen observation and a few dashes of technical knowledge turn it into a learning tool. The obvious topics of wind, depth, temperature, and bottom topography are covered but also there are ones you wouldn’t immediately think of. Things like insects in the water, plants growing in the banks, and local boat traffic all get blended together into a rich storyline of insight and small human moments. Then it moves away from small waters and into larger bodies covering all the things that can affect how the water behaves from lakes and rivers to seas and oceans, eventually ending with the strange and the weird: rogue waves, giant whirlpools, gyres, and windrows. Along the way, this book is full of amazing anecdotes from all corners of the globe. They balance out the technical aspect with how these topics can actually be used in the real world. Some of my favorites are from his experiences sailing with native navigators in the South Pacific. I’ve heard plenty of tales of naked paddlers and sailors in my time, but those stories usually deal with PBR induced bets or from just being isolated from civilization for way too long. Here it highlights how if you know what to look (or feel) for you can find clues as to how you are moving through your environment. Sometimes it just takes being a little closer to the water to notice it. If you were sitting on a cruise ship you would probably miss lot of what the water was trying to tell you (no matter how sensitive you are). If we think about this from a paddling perspective it becomes more relevant. 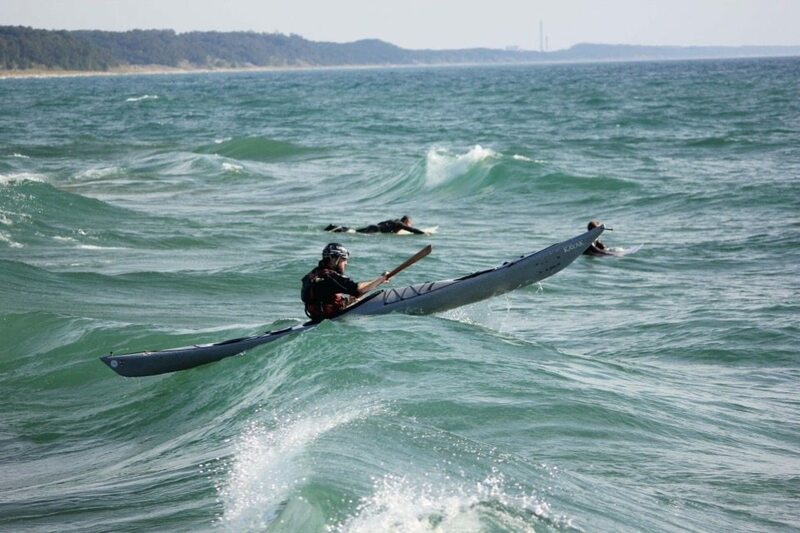 Not only can you see a wave or rapid in your path but you can usually feel how the water moves differently under you as you travel along and pass different features. If you pay close enough attention you will find you will be able to know what is around you while on the water just by how it feels under your boat. I noticed a difference in my own water reading as I was reading the book. I was sitting in my local pub having a mug of craft stout and reading a few chapters when the door opened behind me and a strong wind blew across the threshold. I felt the chill air rush past but also noticed ripples form immediately on the head of my beer and then how they disappeared as the door swung shut. Noticing things like this is exactly what this book really boils down to. Be observant of the water. Why does it behave like it does? What can I learn from it? There is no secret ability or power that makes someone better at reading the water than another. Only time and practice. The more we know about how the water behaves the more we get out of the time we spend around it. Sometimes a good teacher, like this book, is all we need to open our eyes to what has always been in front of us and never noticed.